The upper arms are notoriously difficult to tone at any age, but particularly so as a natural part of the ageing process. Laxity in the skin or excess fat in the upper arms manifests as ‘bingo wings’ and can affect a woman’s confidence, appearance and even the clothes she chooses to wear. 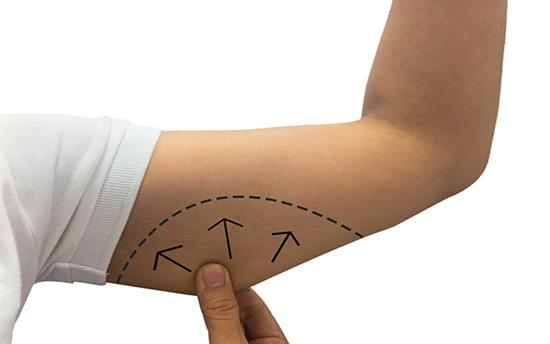 There are several solutions to excess fat and skin on the upper arms, and identifying your specific problem is the key to determining the most appropriate surgical solution. The main options include Brachioplasty which involves a surgical skin removal or liposuction alone which does not involve skin removal. For younger patients who still have good skin laxity or patients who have small to moderate amounts of fat in the area, liposuction will be the preferred option. The recovery time is less than a Brachioplasty, and the tiny incisions and therefore scars are virtually unnoticeable. Liposuction recontours the upper arms by removing the fat and any small amount of loose skin retracts which reduces the ‘bingo wing’ appearance. Mr Chana uses a technique called VASER liposuction which has several advantages over standard liposuction. This technique is a form of liposuction liquefies the fat prior to extraction using ultrasonic energy. The ultrasonic energy is safe and targets the fat cells alone leaving all other anatomical structures untouched which minimises tissue trauma and therefore greatly reduces the level of bruising and discomfort. This form of liposuction has also been shown in scientific studies to improve the degree of skin retraction compared to standard liposuction. Recovery times are also improved. If loose skin in the area of the upper arms is excessive then it will not retract or shrink after liposuction. In this instance, the skin will need to be removed. It’s also the ideal choice for people who have lost a large amount of weight, and therefore have a lot of loose skin. Please bear in mind the decision between liposuction alone or skin removal can be difficult in some situations and it is important you consult an experienced plastic surgeon to make this assessment. There are many doctors who are not surgically trained offering VASER liposuction and will not be able to offer a Brachioplasty with the result that you may get ‘pushed’ into liposuction alone which may not be suitable for you. During a Brachioplasty, the loose skin is removed along the inner aspect of the upper arm leaving a scar which runs a variable distance along the inner upper arm. In severe cases, the scar may extend down to the elbow. The whole procedure is performed under general anaesthetic and may require an overnight stay in the hospital. From Brachioplasty, you can expect a scar which will take about a year to fully mature, although it is consigned to the insides of the arms and therefore will be quite subtle in a day to day life. Most patients find that losing the excess skin far outweighs any disadvantage of having a scar. Even after reading this blog post and other sources on the differences between Brachioplasty and liposuction, it’s quite possible that you will not have sufficient information to make a decision on how to proceed. That’s completely normal and it is advisable to book a consultation in order that you can be fully informed.